I have posted over 70 articles about WordPress platform, but it’s time for our Panda to focus on Google’s Blogger platform. When I started Blogging in 2011/12, I mainly knew about Blogger platform, and I really loved it (before moving to WordPress). I still run a Blogger blog, and Blogger is the place where I started. In this post, I’ll show you how to create and run a Blogger blog in less than 5 minutes. It’s really easy to set up a Blogger blog with your Google account. Blogger is totally free and powered by Google. You can also use your own domain with Blogger without any pro or premium subscription plans. Blogger is 100% free. In order to create a Blogger blog, you need a Google account. You can sign-up for a free Google account or log in to Blogger using your existing Google account at Blogger.com. You’ll be asked to link your Google + account with Blogger to continue. Now, on the left side of your screen, click on New Blog button. Following pop-up will appear on your screen. Give a title to your blog, and choose an address for your blog. Click on Create blog! button to create a blog. That’s it! You just successfully a your first ever Blogger blog. 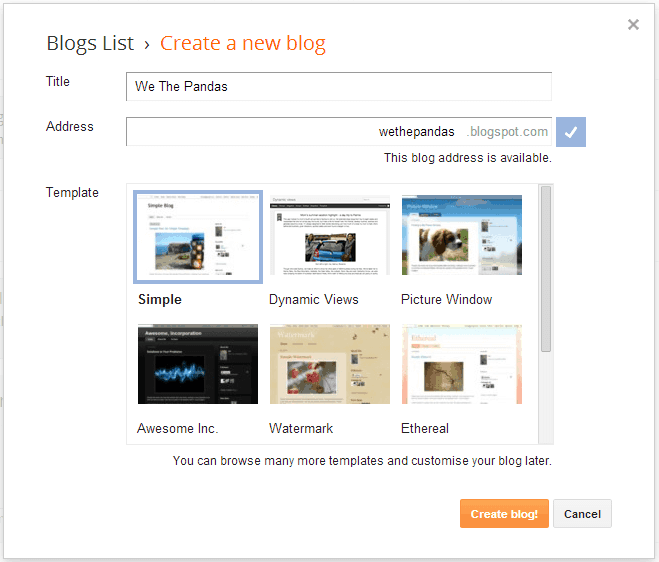 Now, you can post anything on your Blogger blog. You can also customize your blog with various themes and widgets, but we will share them later on the website.